Happy Thursday everyone! 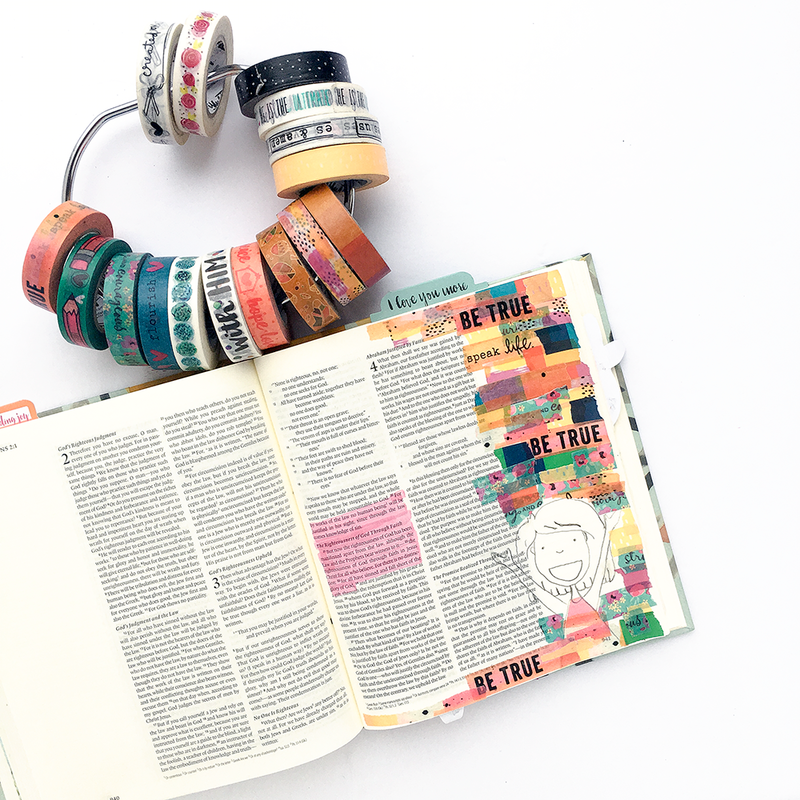 This week our social media team has been busy creating projects using the all the wonderful clear stamps that our Illustrated Faith collections have to offer! First up, Laurie created two cards showcasing her passion for stamping and magical techniques. Just look at the resist she created using the feather stamp from the Seeds of Faith stamp set. That background is just dreamy! And the rainbow borders in her second card using the stamps from Delight in His Day just sing happiness! 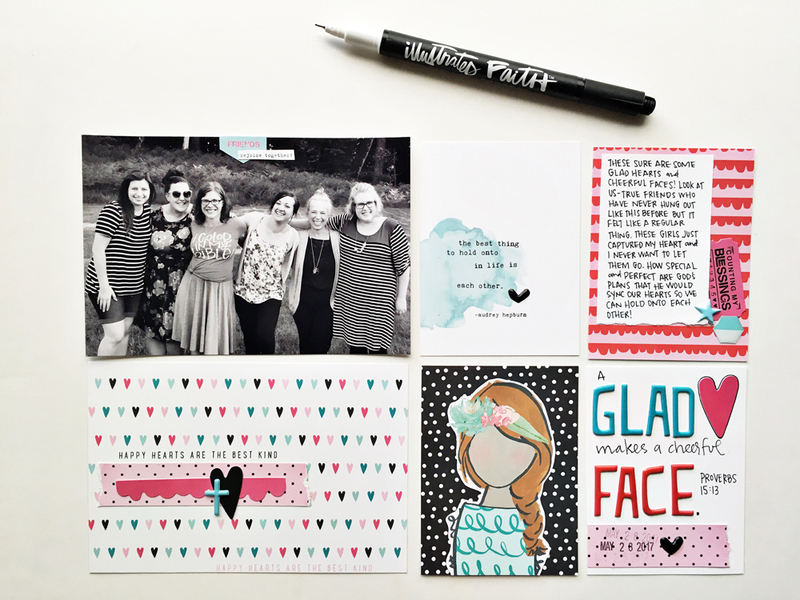 IF Delight in His Day: 6 x 8 Paper Pad, Clear Stamp Set, Paper Pieces, Puffy Stickers. IF Epoxy Mini Hexies Stickers: Oh My Heavens Mix, Bless Her Heart Mix, Olive You Mix, Bananas For You Mix. 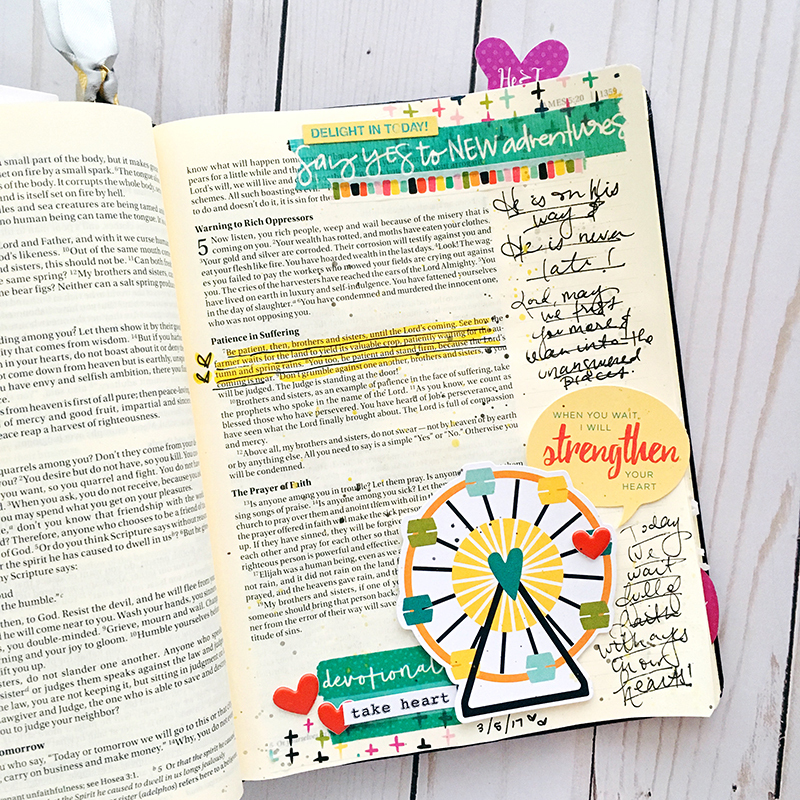 Next up, Jamie created a wonderful faith-based travelers notebook featuring the Homespun Alphas and Numbers stamps in her titles. She then used several additional sets to create a customized book meant just for her own personal inspiration and individual documenting. Love it! Illustrated Faith: Stamps: Homespun Numbers, Homespun Alphabet, Icons, You Are Loved. Everyday Icons Cardstock Stickers. Basics 6x8 Paper Pad. Bella Blvd: Make Your Mark Break Rules Washi. Happy Tuesday, friends. 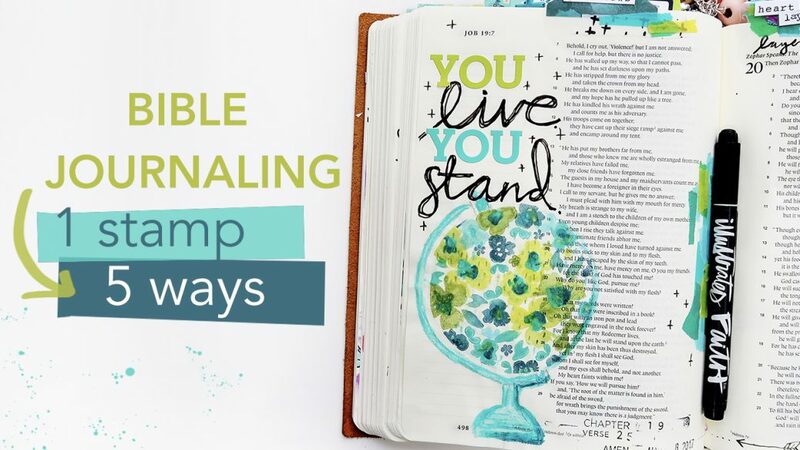 Today we are bringing you some inspiration from our friends over at Illustrated Faith and their blog. Hi friends! 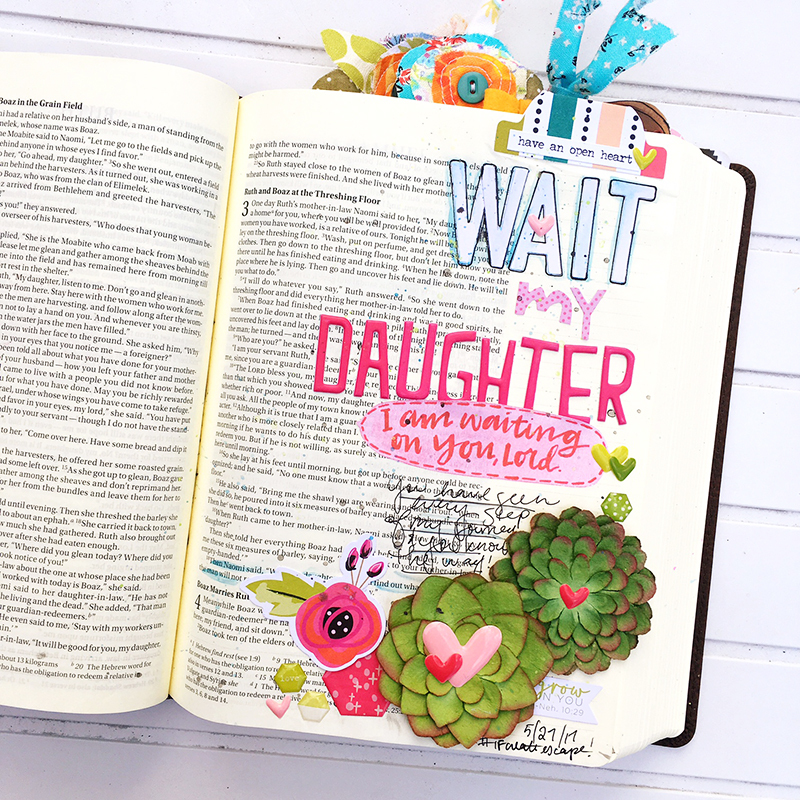 Have you been enjoying all of the creative ways to use the new Acrylic Words? They really are so versatile and definitely fun to use! Today, I have two projects to share with you. Being a cardmaker, I of course used one of the Acrylic Words on a card! The second project is a sweet little gift bag, decorated with a sparkly Acrylic Word. I love the pretty, scripty font of the new Acrylic Words! Some of them are fairly large, which are perfect for making the focal image on a card! For my card, I started by combining a couple of patterned papers from the IF Seeds of Faith Paper Pad. I wanted to soften the top heart paper a little bit so I rubbed some white pigment ink in the center of it. So that the fearless Acrylic Word (from the Fearless & Strong package) would really stand out I added a strip of black cardstock behind it. This also serves to create a visual border between the two patterns. I wanted to add just a little bit of color to the fearless Acrylic Word, so I sponged on a some pink pigment ink along the bottom. To complete the sentiment, I added some Oreo Black Wonky Alpha Puffy Stickers. I decorated with several Seeds of Faith Paper Pieces and Puffy Stickers. My next project features another Acrylic Word, this time on a festive little gift bag! I found this cute polka dotted bag in my stash and though it would look great with the new Secrets of the Sea collection! I pulled together some Secrets of the Sea - Girl Paper Pieces and a piece of patterned paper. I adhered them all on the gift bag. I added a strip of coordinating High Tide Washi Tape along the top along with a big pink bow. For embellishment, I added a blue Puffy Heart Sticker. I just love how easy and quick it is to create with all of the coordinating products available for each collection! It's a bit hard to see in the photo, but I covered the happy Acrylic Word (from the Happy & Smile package) with fine, iridescent glitter. Here's a tip - use spray adhesive for a faster and more permanent bond. I simply sprayed the word with spray adhesive and then immediately sprinkled it with the glitter. I'm so glad you joined me here today! NEW RELEASE | Seeds of Faith Collection from Illustrated Faith | Win It Before You Can Buy It! Here's a closer look at the patterned paper designs from this gorgeous collection! Want to get an up-close view of all the pieces in this inspiring new collection? Check out our video below and make sure to subscribe to our YouTube channel for all of our new product releases and creative team process videos! 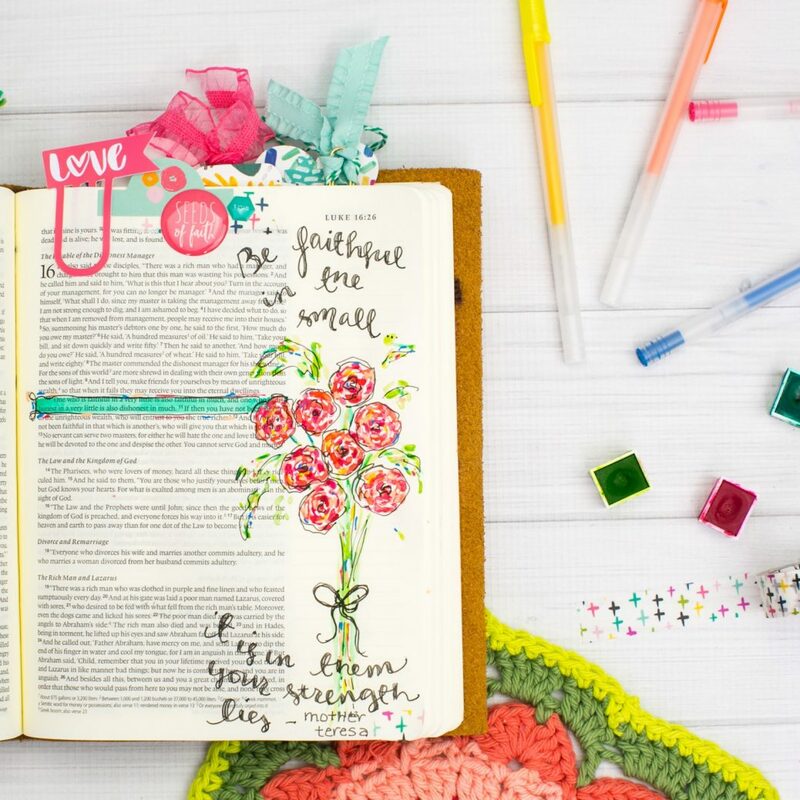 Would you love to be one of the first to get your hands on gorgeous new Illustrated Faith collection, Seeds of Faith? Here's your opportunity to win the entire collection! Write a comment on this post between now and Sunday, January 22, 2017, Midnight EST for you chance to win and tell us what you'd love create with this inspiring new collection! Winner will be announced on Tuesday, January 24, 2017. Good luck! Tell your friends about our new releases and giveaways by using the hashtag #BellaBlvd and #IllustratedFaith in your social media posts!